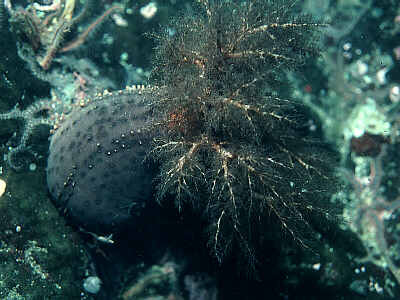 Description: A large black sea cucumber with enormous bushy tentacles. The body is fat and the skin thick and leathery. 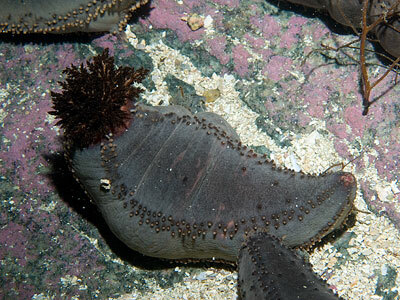 There are five distinct rows of tube-feet. The skin of small specimens contains spicules but these are very sparse in larger specimens. Up to 50cm in length. Habitat: Lives in rocky areas, with the body attached to elevated rock surfaces, often just below low tide mark and in shallow water. Distribution: Recorded from the north east coast of Scotland, Shetland and Orkney. The range may have retracted northwards in the last hundred years as there are old records from the west coast of Scotland. 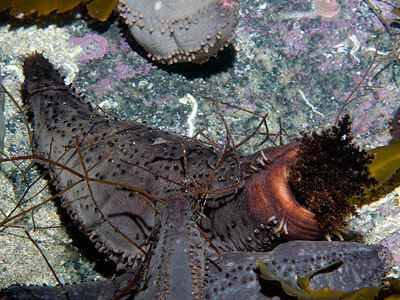 Similar Species: The large bushy tentacles are quite different to those of Holothuria forskali the only other large black sea cucumber likely to be encountered. Tube-feet in five distinct rows. 10 huge finely branched tentacles. Picton, B.E. & Morrow, C.C. (2016). Cucumaria frondosa (Gunnerus, 1767). [In] Encyclopedia of Marine Life of Britain and Ireland.